Zimbabwe's second largest mobile network provider NetOne has signed a donation agreement with the Zimbabwe Republic Police (ZRP) traffic department in a bid to decongest the capital city. The signing ceremony was held at Moris Deport in Harare yesterday where NetOne donated 4 motor bikes, 217 reflective jackets, 31 rain suits and whistles valued at $65 000.The ceremony was held under the theme "Safe Cities Partnership". Speaking at the ceremony NetOne board chairman James Prince Mutizwa said the company selected 28 prime intersections experiencing high traffic volumes throughout Harare's Central Business District (CBD). "As NetOne we have selected 28 prime intersections, experiencing high traffic volumes, throughout the CBD. This marks the initial phase of our Safe Cities Partnership, with ZRP traffic section," Mutizwa said. The 28 intersections identified for safe cities partnership deployment include JasonMoyo/Chinhoyi, Jason Moyo/Leopold Takawira, Jaison Moyo/ Kaguvi, Jason Moyo/kaguvi, Jason Moyo/MbuyaNehanda, JaisonMoyo/Rotten Row, Jaison Moyo/Simon Muzenda, Julius Nyerere /Robert Mugabe, Julius Nyerere /Jaison Moyo Julius Nyerere/Samora Machel, Samora Machel/Seventh, Samora Michael /Sam Mujoma, Samora Machel /Simon Muzenda, Samora Machel/ Leopild Takawira, Samora Michael /Chinhoyi, Samora Machel/Rotten raw, Samora Machel/Rekai Tangwena, Samora Machel/Bishol gaul, Rorbert Mugabe/ Simon Bizeki, Robert Mugabe/ Chinhoyi, Robert Mugabe/ Simon Muzenda, Seventh street/ Tongogara Avenue, Prince Edward /Tongora Avenue, Sam Munjoma/ Tongogara Avenue, Rotten Row/Crisps (Mupedzanhamo), Seke road/Crisps (Cocacola) and Herbert Chitepo/Simon Muzenda. Mutizwa said the donation is a initial move which is about capacitating the traffic police so that they are physically available in the CBD and decongest the traffic. "This is phase one which entails capacitating the traffic police so that they are physically available to man and ensure smooth flow of traffic across all 28 intersections. 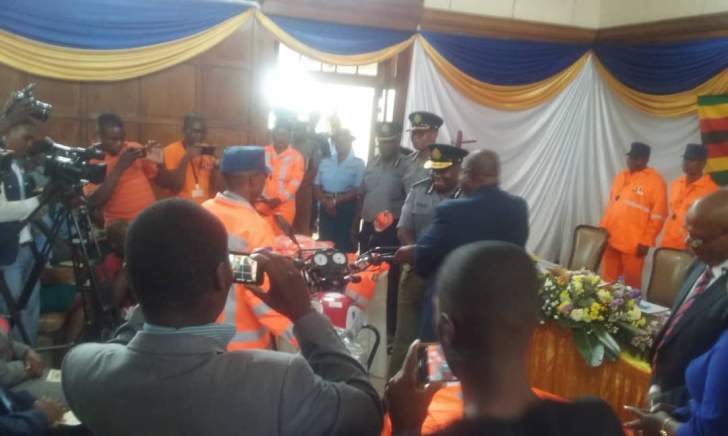 I am delighted to be handing over the equipment for this phase of the Safe Cities Parternship, which comprises of four motorbikes, 217 reflective jackets, 231 rain suits and whistles to capacitate the ZRP Traffic police," he said. ZRP deputy commissioner-general operations Learn Ncube expressed gratitude in signing the agreement saying the contract will help in easing up traffic problems in Harare. "As ZRP we are deeply gratified with the donation worth $65 000 and the contract signed between ZRP and NetOne will surely relates to easing up traffic problems, this will enhance our capacity to decongest the city", Ncube said. Ncube called on all stakeholders to the police to emulate what NetOne did before urging the police officers to deliver to the best of their expectations. "The fight to decongest traffic requires a collective will to curb traffic jams from all stakeholders, we hope other stakeholders emulate what NetOne has done. To the officers l say you should deliver to the best of your expectations." He also castigated the spouting taxis affectionately known as mushika-shika for contributing much to the decongestion of traffic in the CBD.